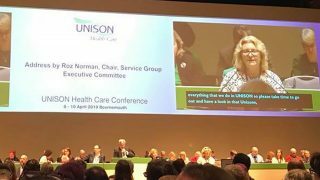 Health members condemned the chronic underfunding of the NHS under successive Tory governments, when they debated the issue on the last day of conference in Brighton today. 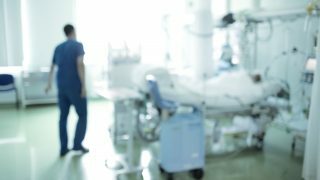 They agreed that the consequences were dire for both patients and NHS staff, who were unable to deliver the level of care they wanted to. 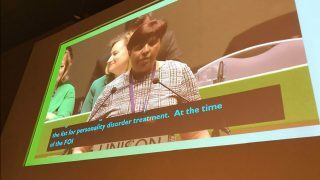 Adopting a motion on The funding crisis and its impact on the workforce, conference noted that successive Westminster governments have “failed miserably” to produce a funding settlement that works for the NHS – either directly for England or via the Barnett formula in the devolved nations. 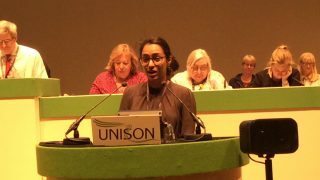 Introducing the motion, George Barron, vice-chair of the health service group executive, accused “hapless” health secretary Jeremy Hunt of failing to see that the NHS was in crisis. Mr Barron said evidence of the crisis could be seen in the numbers of people waiting in hospital corridors because there were no beds; ambulances delayed at hospitals because patients could not be admitted; people unable to get GP appointments; growing waiting times in A&E; and the fact that hospitals were not being properly cleaned because there were not enough domestics. “It is not our members’ fault,” he said. “Every day, our members are working their damn socks off. To see [criticism] in the press day after day must depress many of them. “NHS bodies keep saying they need more money. The Tory government gives them half of the amount. more people not getting support for their social care needs and a 20% increase in people detained under the Mental Health Act. 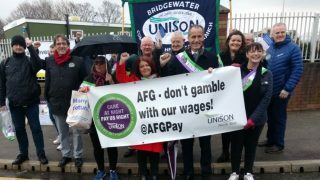 “What this means for members is job losses, reorganisation changes, downbanding, an increase in workload, an increase in stress and anxiety, reduced work-life balance and low morale,” Ms Booth said. 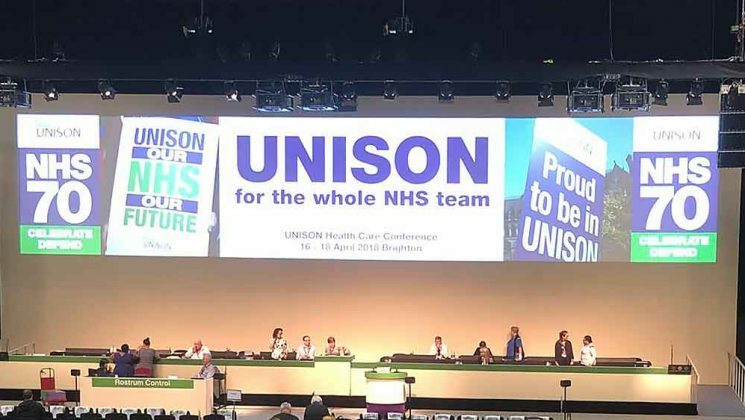 She urged the union to continue to build high-profile campaigns, such as the One Team campaign and Safe Staffing Levels campaign. assist branches and regions in their actions in defence of the NHS. Join the demonstration called by the People’s Assembly and Health Campaigns Together.